Well, I made a goal of running a 50k (32 miles) this year, and the race I chose, was the Zion Ultra 50k. I was very blessed to be given an entry from a friend of mine who was a sponsor for the race. I trained very well for it. I got my mileage in, and felt ready for the race. However, I was clueless on the course. The description on the site was vague, and this was the first year they did a 50k, so there was nothing to compare times to. I figured that I would play it by ear, and just kind of follow the crowd. I was given an Ultraspire spry from the company to race with, and I recently received a sponsorship from Mott’s Applesauce, which gave me great fuel, and of course, I have me Altra shoes and gear. I was really, really feeling like I had what I needed to be prepared. My biggest concern, however, was my family. I wanted to make sure they were taken care of. My parents were so great to have the 5 older kids stay the night. Thankfully they only live 30 min away from the race, and the plan was to bring the kids down to watch me finish. Adam would have Axel during the race. I was worried about my 6-month-old baby, Axel. He is still nursing mostly exclusively, and I worried about him being hungry. A few weeks before, I began feeding him some of the Mott’s-to-go that I received, and thankfully, he loved it! I fed him right before the race, and felt that if everyone’s needs were taken care of, then I would be able to relax and run. The race started out in the dark, and thankfully there were a lot of people with head lamps, so I just followed them. We started out at a really slow pace … like 8:30. I figured everyone else knew better than I did, so I just stayed with them. After about a half a mile, I felt something wet all down my backside. My water had leaked, and it was all gone in a matter of seconds. My hear sunk because I knew that there were only three aid stations on the entire course, and I didn’t know where the first station was. I continued on. After the first mile, the road turned up a dirt trail, and the group I was following, went the wrong direction. Thankfully, someone yelled for us to turn around. This would happen another 5 times during the race. At about mile 2, there was river we had to cross. It was wet, and immediately following, there was a lot of loose dirt. So, yeah, dirt and sand = mud. Yuck! It was right away that I felt some waves in both my shoes. I wasn’t sure what it was. I stopped to pull up my sock, but that didn’t fix the problem, so I just kept going. I stayed right in first place for the women, right behind two really cool guys. I felt great, and it felt easy. As we continued on, we were running on slick rock, and it was really difficult to navigate through. In the middle of all this was the first aid station, at about 7 miles in. I wanted to fill up my pack, but I was so scared of getting lost if I wasn’t close by somebody, so I just filled up my UltrAspire cup a couple of times with Gatorade, and continued on, still feeling really good. Between that, my applesauce and Sport Beans, I was feeling really good. At about mile 14 we were still on slick rock, and I felt something coming up my leg. I reached back, and found that it was my insole of my shoe. It had come out! Still not wanting to lose sight of the guys ahead of me, I just rolled it up and put it in my pack. My shoe felt a little lose, but it wasn’t too bad. I did start to feel a little depleted at about mile 17-18, and thankfully, there was where the aid station was. I filled up my water. By this time, the course had better markings, so I wasn’t too scared of losing sight. At about mile 20, there was a killer downhill, which I was really excited for. I needed to pick up some speed. The bad thing was, I began to feel a blister coming on in the foot that I lost the insole. I thought I’d better stop and fix my shoe. When I did, I knocked something in my water pack that caused all the water to come out. With another three hard miles before another station, and with me using up most of my applesauce and beans I felt like I was in trouble … which I was. I got passed by the first girl at mile 22.5, right before the last aid station. By the time I reached the station, I was delirious. I was so hungry an thirsty. I ate a half a sandwich, a piece of a watermelon and had some water, also filling up my pack. I remember my friend, Terral from Unshoes was there. He asked me how I was doing. I told him I was struggling and really missed my family. He then told me that the hardest part of the race was up ahead, aka, “The Monkey Bowl.” It didn’t really register. At that point, I was passed by a friend of mine, Kendall. And again, my water started to gush out. I caught it before it had all emptied out, but again, I didn’t have the hydration I needed to finish the race, and I had barely any fuel left. I soon realized what he meant when he said that I was entering the most difficult part of the race. The Monkey Bowl was unreal. It was a steep hill climb with lots of boulders and un-runable terrain. Completely unreal. There was even a part that I had to pull myself up by a rope to get over a section. Normally, this would have been fun, but not 26 miles into the race when I have no food, no legs and no mind. I remember standing there on that path. There was nobody in front or behind that I could see. I was looking down to a very long drop down, and a very large climb up. I have never felt so alone. For a moment there — and I know that this was mostly the delirium — but I thought I might never see my family again. That was a scary thought. I wanted nothing more than to be where they were, but I couldn’t move forward fast enough. I have never felt such a feeling of complete discouragement. At this point, there were two girls that passed me, and another came up. I asked one of the girls if she had a phone. I was so worried about my family waiting at the finish, and wanted to let them know how I was doing. She was so nice. She stopped, let me use her phone, let me have water and gave me a Cliff Bar. She had quite the potty mouth, but to be honest, her voice, regardless of slang, was music to my ears. I was able to eventually make it to the top of the mountain at 27 miles. As I began slowly running down, another lady came up on me. I had a moment of uncertainty of the total distance of the race, so I asked her if it was 32 miles. I thought I could make it another four. She turned and said, “No, I was told this course was long and is 34 miles. At that point, I lost it. There was no way I could complete another six miles, especially at the pace I was going. And, with no more fuel or water, there really was nothing I could do. As I rounded the corner, I came up on the some cars. The lady ahead of me stopped at one of them to get some chips and fuel. She said that if I wanted, her husband could take me back. At that point, I saw no other option. I needed to be done. That was it. He was so kind. He gave me a drink, some snacks, let me use his phone, and drove me back. As we drove back, I realized that it was a downhill decent on the road for a while, and I really did only have four miles to go. There was nothing I could do about it, now. When I got to the finish, all I wanted was to hug my husband and kids, but nobody was there. They had all gone looking for me. I was so sad. I really needed to cry, but I knew nobody. I felt so alone. Then, I saw a friend of mine who was there cheering people on. I asked for a hug, and she was kind enough to give me one. I may have even cried a little. Finally, I connected with my family. I was so glad to see them all. My parents and three of my brothers came down, too. I really felt so bad that I couldn’t put on a better show, but I did my best. Next time, I will bring a surplus of fuel and make sure I have working water. It was a great learning experience. Hopefully I can do better next time. For now, I will focus on my next races. I have a half on April 19, and a marathon on June 14. I really, really need a success. I am bummed :(. Here is one picture of me at about mile 16. I am the girl in the back behind the two guys I followed for the first 20 miles or so. 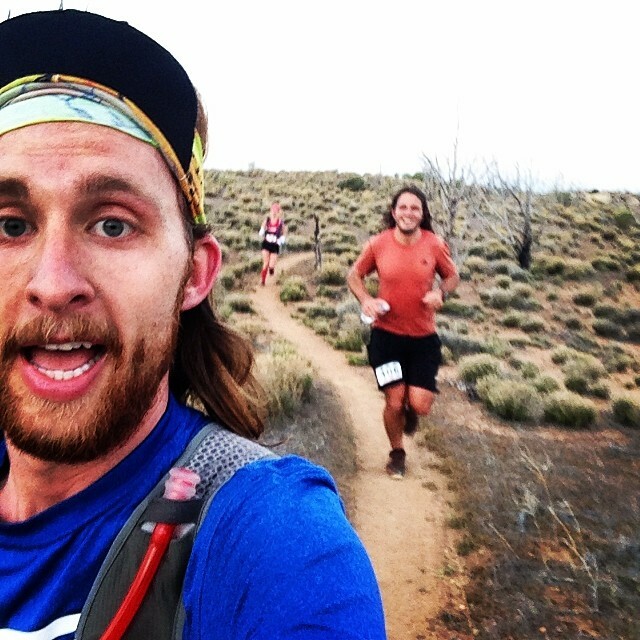 This entry was posted in born to run, exercise, running, Trail running and tagged altra zero drop, dnf, motts applesauce, ulstraspire, ultra marathon, unshoes, zion 50k. Bookmark the permalink. Next time will be better. Enjoy looking forward to your next races. Oh, thank you so much for this! I have really been struggling. I train 99% on trail, but I race road. This was my first trail race. What you said about time was so spot on, and is something I have been thinking so much about. With road races, I know that if I start a marathon at 6 am, I will be done by 10 (relatively speaking). I like consistency aspect of the road. I like looking at my watch, seeing that I have 6 miles to go, and knowing that all will be done in approx 38 min. In this race, I looked at my watch with 10 miles to go. I gave myself 1.5 hours to finish. I had no idea that the next 2 miles would take me 40 minutes of climbing! When I had no concept of time, and had no idea when I would be done, that is when I shut down. like you said, as much as a medal would have been nice, seeing my kids was all I could think about. Nothing else mattered. Thank you, again for your post. IT is really what I needed. Haha … I don’t run a 4 hour marathon. I meant to say, I will he home by 10 :). Also, I ran in my intuitions, too. Bad idea. I gotcha…about the timing. And I love those Intuitions, they just were not made for the trail. I’m running a road marathon next weekend in them. Pretty sure I won’t slip and fall, nor will I need screws in them! Thanks, and good luck to you, too! This all sounds very awful but the fact that you kept running after you lost a liner (which I have never heard before) is absolutely crazy! I was concerned that you were going to write about passing out from dehydration or lack of fuel so at least it was only minor delirium in comparison. CRAZY but I am sure you will do amazing at your next two races! Glad you’re ok! Thanks. I really have never felt that way before, and NEVER want to again. I can’t wait to get back on the horse, though. This is killing me! I already have a race picked out … :). I hope you are doing well! a question off topic: What sports are you doing besides running? Do you do a workout for your upper body or something? Would be interested to know what you recommend! I mostly run, but I do try to do push-ups and core work when I have time. I do need to be better at it, though :).